Holocaust hero or villain who collaborated with Nazis? Posted on December 7, 2016 in: Nazis, Nazis/Nazism, THINK PIECES & OPINION|Comments Off on Holocaust hero or villain who collaborated with Nazis? Paul Bogdanor digs deep into the contentious legacy of Rudolf Kasztner, and his attempts to save Jews from the Holocaust. Paul Bogdanor has penned a well-researched book on the contentious Kasztner affair – a controversy that commenced in wartime Hungary and has continued until the present day. 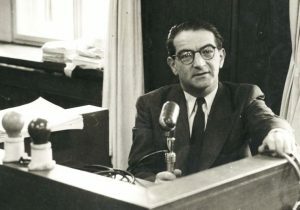 In the summer of 1944, a minor Jewish figure, Rudolf Kasztner, negotiated with Adolf Eichmann in the hope of saving hundreds of thousands of Hungarian Jews as the Third Reich was rapidly shrinking. While he was doing so, 437,402 Jews from rural provinces were deported to Auschwitz over an eight-week period. The affair was characterized as the “goods for blood” proposition, an exchange of trucks for Jews, the “freedom” train to Switzerland carrying 1,684 selected Jews, and Kasztner’s refusal to warn Hungarian Jewry of their impending doom. Moreover, his prime accuser, Malkiel Gruenwald, had a long criminal career back in Hungary and was reputedly a police informer in Israel. In 1957, Kasztner was murdered by a far-right group, Malchut Yisrael, becoming in death either a martyr who did not deserve his fate, or a villain who got his just deserts. In Kasztner’s Crime, Bogdanor has assiduously attempted to dispel the fog of these distractions and to analyze Kasztner’s actions in 1944. He develops the arguments put forward by Ben Hecht and Uri Avnery decades ago, presenting not only evidence, but also presumption and interpretation. It is a convincing case and he demands a guilty verdict. The Nazis wanted to avoid – at all cost – another Warsaw Ghetto Uprising, but were ideologically committed to the extermination of all Jews. Bogdanor argues that the tortuous negotiations with the Jews were designed to dangle the hope of rescue and to drag them out for an eternity while the deportations continued apace. It served the Nazi desire for a total absence of resistance. When Eichmann arrived in Hungary in the spring of 1944, he was accompanied by 150 to 200 staff who were expected to deport 750,000 people. The Hungarian Interior Ministry offered 20,000 gendarmes to support Eichmann in the belief that the Jews were merely being sent to “work” camps. In this lethal card game, the Nazis held the aces while the Jews looked for any scintilla of salvation. Kasztner promised to pay the Nazis $200,000 per month in the hope of postponing the deportations and prolonging the negotiations as the end of the war approached. Based on examples from Slovakia, the possibility of bribery from funds raised by free Jewry was considered. Everything came to naught, and such proposals were buried in the cemetery of wishful thinking – a cemetery guarded by Eichmann’s SS. Kasztner appears to have become entrapped in a delusion of self-importance and a belief that eventually his many compromises would pay off. He even wrote that the deported Jews were alive in ‘Waldsee’ – a Nazi euphemism for the reality of Auschwitz. Kasztner had met Oscar Schindler in November 1943, and was well aware of the extermination of European Jewry in the camps to the East. Yet he did not warn the Jews of Cluj, his home town, and other nearby locations, to escape across the nearby Romanian border. Did he wish to avert widespread panic – which would serve German aims? Did he refuse to call for an armed revolt because so few arms had been secured from Tito’s partisans? Did he believe that the few had to be sacrificed so that the many should live? The mother of Hannah Szenes did not entertain such ideas during the trial, and accused Kasztner of betraying her daughter and sending her to her death. Yet the Hungarian Service of the BBC was broadcasting dire warnings of what was happening. Did this fall on deaf ears? Did no one spread such information in Hungary? Bogdanor demonstrates that Kasztner’s story after 1945 constantly changed, peppered by omissions and contradictions. The author argues that Kasztner testified on behalf of Nazis whom he had worked with, in order to construct a common protective alibi during a time when survivors were looking for retribution. Utilizing new evidence, Bogdanor is critical of eminent historians such as Yehuda Bauer for their interpretation of the Kasztner affair. David Ben-Gurion commented in 1955 that the final verdict in this saga should be left to future generations. Bogdanor believes that time has now arrived, and he has written a highly detailed work. Yet at the back of the reader’s mind, there will still lurk the question of what he or she would have done in Kasztner’s position. A course of action which resides in the grayness of immoral choice – the difference between bad and worse. Bogdanor’s book provides uncomfortable food for thought in this personal arena as well. BERLIN, Germany — Wartime diaries kept by top Nazi henchman Heinrich Himmler, serialized this week in Germany’s daily Bild, offer chilling insights into the life of one of the principal architects of the Holocaust. 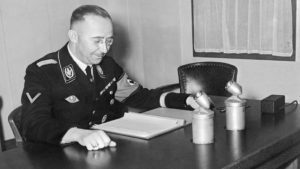 Himmler, the head of the Nazi paramilitary SS, kept tabs on even the banal minutiae of his daily comings and goings, even as he oversaw the systematic slaughter of six million European Jews. The journals, unearthed in Russia in 2013 and currently being studied at the German Historical Institute in Moscow, reveal a confidant of Adolf Hitler as a micromanager marked by deep contradictions. 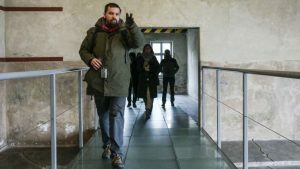 They also “help to better make sense of key events and understand who took part in decision making for the regime,” researcher Matthias Uhl of the German Historical Institute told AFP. The documents, found in the archives of the Russia defense ministry, cover the years 1938, 1943 and 1944. The German institute plans to published an annotated version by 2018. The journals for 1941 and 1942 were already discovered in 1991 in Russia, which holds 2.5 million documents from the Wehrmacht, the Nazi-era German military. The image that emerges is of a caring family man who nevertheless kept mistresses and had secret children as part of one illicit love affair. Himmler is shown to be a passionate stargazer and avid card player even as he ordered massacres and oversaw the death camps. “The man who planned the Holocaust was obsessive about organizing his personal life,” Bild said. On January 3, 1943, for example, Himmler received one of many “therapeutic massages” from his doctor, took part in meetings, called his wife and daughter and then ordered, after midnight, the killing of several Polish families. According to Bild, Himmler was an ambitious careerist who met with more than 1,600 people between 1943 and his suicide in British custody in May 1945. “The number of contacts, as well as attempts by Himmler to gain influence through the SS on important institutions of the party, state and army, are impressive,” Uhl said. Himmler’s secretaries, one of whom, Hedwig Potthast, bore him two children, noted down regular inspection tours to the concentration camps including Sachsenhausen, with Nazi propaganda chief Joseph Goebbels, on March 10, 1938, and the Sobibor extermination camp on February 12, 1943. “Himmler wanted to have a demonstration of the ‘effectiveness’ of killing by gas,” Bild said.